Get your daily four-minute dose of sanity on the Breakpoint Podcast plus teaching, interviews, and more. The summary of their plan was posted on Ocasio-Cortez’s website Thursday but then taken down after mockery and criticism, even from within her own party. This Green New Deal was billed as a solution, not only to climate change but pretty much to all of society’s ills, and is more ambitious than either its Depression-era namesake or Al Gore’s wildest dreams. Once that’s done, the legislators want to “retrofit every building in America,”— yes, that’s a quote, again—with “state of the art energy efficiency.” They also want to ground all airplanes within a decade and replace them with “highspeed rail.” No word yet on how much the railway to Hawaii will cost. The Green New Deal also promised a “family-sustaining wage, family and medical leave, vacations, and a pension” for every American, as well as free education for life, including college and trade school, “healthy food,” “safe, affordable, adequate housing,” and “economic security” for all, even if they are “unable” or—get this—“unwilling” to work—2 Thessalonians 3:10 gives a clear response to that idea. As many commentators noted, the Green New Deal is really an attempt by a radical wing of the Democratic Party to signal its ideological purity. According to Jonah Goldberg at National Review, this is more utopian Christmas list than it is legislation. Even if Congress were to pass it—which would never happen—they couldn’t actually act on it in any real sense. And yet, Harsanyi points out, it’s worth noting that during its very short life, the proposal garnered endorsements from Democratic presidential hopefuls Cory Booker, Kamala Harris, Elizabeth Warren, Kirsten Gillibrand, Julian Castro, and Beto O’Rourke. Because it struck such a chord with the up-and-coming of the party, we’d be foolish to dismiss it as mere posturing. There is a worldview behind the Green New Deal, which as Goldberg writes, “is dangerous.” The proposal, like every worldview, answers at least two questions: (1) what’s wrong with the world, and (2) how can we fix it? On both counts, the Green New Deal is profoundly out-of-touch with reality. 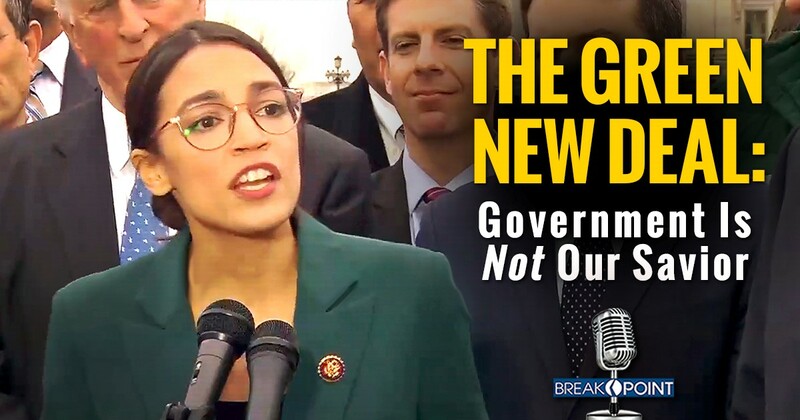 Rather than human evil, the breakdown of the family, or the compromise of morality, the Green New Deal identifies the modern economy as the problem, and promises to dismantle it without offering any viable replacement. It also guarantees free money, housing, education, healthcare, and even food, without any realistic way to pay for it. In short, what Ocasio-Cortez and Markey offer is the state as our savior. And they seem to believe that this is not only wise, but economically and technologically possible, if Washington will only decree it. The Green New Deal, as unfeasible as it may be, is an expression of a worldview that is very popular and which dominates left-leaning universities and media. It sees all problems as political problems and therefore all solutions as political, too. Though the plan isn’t online anymore, you can be sure legislation is forthcoming. After all, so many of the legislators in power right now hold to some version of this utopian vision of the state, so it could hardly be otherwise. If we don’t take this worldview seriously, especially in helping the next generation understand and dismantle it, it won’t be a laughing matter.